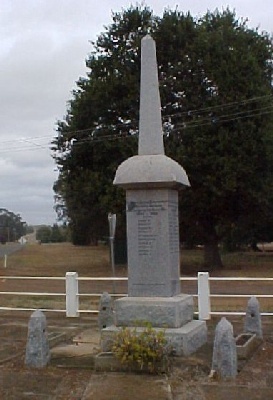 The following names are those listed on the Sandford War Memorial and various Honour Rolls at Sandford in south-west Victoria, Australia as having served in World War 1. The additional information column is from attempts to identify the individuals named on the Memorial. Sandford State School No.1654 Honour Roll. St Mary's Anglican Church, Sandford Honour Roll. JACKSON, H Henry JACKSON, b. 1876, Sandford, Victoria, son of James JACKSON and Ann WHITE. Recorded as a 39 year old groom, unmarried of Sandford when he enlisted in the AIF on 9 Jun 1916 but discharged as medically unfit with TB on 4 Aug 1916. He died in Ballarat in 1956. + JONES, W William George JONES [MM], born 1873 at Dartmoor, Vic, son of John Thomas JONES & Eliza O'TOOLE. + KING, B B. KING, b. ____, son of ____ and ____. + McCABE, R Reuben Ernest McCABE, born 1895 Casterton, son of Ellen 'Nellie' McCABE who later married Francis Thomas McCAUSLAND. Pte 1370, 16th Battalion, AIF, died of wounds, ANZAC, Turkey. Named : Christ Church of England, Casterton, Honour Roll. Named : St Mary's Anglican Church, Sandford, Honour Roll. Soldier Settler : "Nangeela" Estate, near Casterton. Casterton Town Hall Honour Roll. Casterton Christ Church (C-of-E) Honour Roll. + OSWALD, T Thomas Francis OSWALD, born 1887, Casterton, son of Robert James OSWALD and Annie Elizabeth McCORMACK. BARBER, J M James Maxwell BARBER, Pte 3014, 21st Battalion, 1st AIF, enlisted 3 Jul 1915, embarked 15 Oct 1915, trandferred to 7th Battalion, AIF 24 Feb 1916 in Egypt, WIA 18 Aug 1916, France, RTA 13 Apr 1917. James Maxwell BARBER was born in 1888 at Sandford, son of Richard BARBER and Catherine MAXWELL but the family had moved to Maffra in Gippsland by 1889. BYRNE, A V Albert Vincent BYRNE, Pte 4938, 4th Pioneers, 1st AIF, enlisted 3-07-1915, RTA 10-12-1918. Albert Vincent BYRNE was born at Sandford in 1880, son of Frederick Joseph BYRNE and Eliza LAWFORD. He died in 1925, in Prahran, Victoria. Sandford Sons of Temperance WW1 Honour Roll. DIX, J F Joseph Francis DIX, Cpl 805, 8th Battalion, enlisted 20-07-1915 RTA 20-11-1918. Joseph Francis DIX was born at Sandford in 1892, son of James Nicholas DIX and Margaret Theresa DOYLE. Joseph was an older brother of T DIX (Peter Thomas DIX, L/Cpl 4182, 8th Battalion, 1st AIF) listed on the Sandford War Memorial. FORDHAM, W J William James FORDHAM, Pte 4104, 24th Battalion, 1st AIF, enlisted 13-12-1915, RTA 17-03-1917. William James FORDHAM was born at Sandford in 1871, son of Henry Alexander FORDHAM and Mary Ann PLACE. GRINHAM, J N L John Norman Leonard GRINHAM, Pte 2164, 59th Battalion, enlisted Mildura, 4-04-1916 RTA 10-06-1919. John Norman Leonard GRINHAM was born at Sandford in 1895, son of Charles GRINHAM and Sarah Jane LOVELL. HOLMES, F J Frederick James HOLMES, Pte 266, 32nd Battalion, 1st AIF, enlisted Adelaide 7-09-1915, RTA 18-08-1917. Frederick James HOLMES was born at Sandford in 1887, son of George HOLMES and Julia HARMAN and he was a cousin of Edgar Charles HOLMES listed on the Sandford memorial. Soldier Settler Glenorchy Estate near Merino. McLENNAN, J K James Killeen McLENNAN, Tpr 426, 8th Light Horse Regiment, 1st AIF, enlisted 16-09-1914, RTA 3-07-1919, Farrier. James Killeen McLENNAN was born at Sandford in 1886, son of Donald McLENNAN and Mary Christine KILLEEN and he died at Horsham in 1966. McLENNAN, K G Kenneth George McLENNAN, Dvr 20984, 14th Field Artillery Brigade, enlisted 17-11-1915, RTA 7-02-1919. Kenneth George McLENNAN was born at Sandford in 1875, son of Murdoch McLENNAN and Christina THOMPSON and he moved to Toowoomba in Queensland. McLENNAN, W R William Rae McLENNAN, Pte 721, 2nd Machine Gun Battalion (gassed in France); Natural history collector and Ornithologist in northern Australia, enlisted 14-03-1917, RTA 20-12-1918. William Rae McLENNAN was born at Sandford in 1886, son of Donald McLENNAN and Mary Christine KILLEEN and he died at Sandford in 1935. McPHERSON, D Donald McPHERSON, Pte 1887, 38th & 6th Battalion, 1st AIF, enlisted Horsham 28-02-1916, RTA 31-01-1918, served in France. Donald McPHERSON was born at Sandford in 1874, son of John Andrew McPHERSON and Mary Jane BALFOUR. Donald married Mary Jane WHITEHEAD at Horsham in 1901, they had 4 children, he worked for the Victorian Railways after WW1 and both Donald and Mary died at Mount BARKER, SA where Mary's family was living. Wando Vale S.S. Honour Roll. PHILLIPS, S G Stanley Gordon PHILLIPS, b. 1891, Sandford, Victroia, son of John William PHILLIPS and Ellen SCHICKERLING. WW1 Nominal Roll information: Dvr 2660, AIF Headquarters, enlisted 21-06-1915, RTA 27-09-1919. Australian Archives information: Service No 68850, POB Sandford VIC : POE Melbourne VIC : NOK M Phillips Ellen. + SHAW, A D Alexander Davidson SHAW, born 1883 Sandford, Victoria, son of Thomas SHAW and Elizabeth DAVIDSON. Pte 27977, New Zealand Rifle Brigade, died, 15 Jan 1917, Wiltshire, England. SHAW, G George SHAW, born 1860 Sandford, Victoria, son of Thomas SHAW and Mary LOVE. Listed as 54 year old horse breaker of Jackson St, Casterton when he enlisted in WW1. Served as Pte 483, 1st Remount Unit, AIF, enlisted 26 Oct 1915, RTA 18 Dec 1916. SMALPAGE, E B Eugene Best SMALPAGE, born 1882 Sandford, Victoria, son of Francis George SMALPAGE and Jamesina BEST. He followed the gold rush to Western Australia and served in the Boer War as Trooper 413, 8th Australian Commonwealth Horse, Western Australia. Enlisted 31 Jul 1916 in WW1 and served overseas as as Pte 3287, 10th Light Horse Regiment, AIF. RTA 27 Jan 1919, m. 1916, WA, Christina BALL, d. 1962, Nedlands, Perth, Western Australia, buried Karrakatta Cemetery, Perth, WA.